LCD Repair platform XTABLE 853A V3 designed for mounting on the preheater NET WEP 853A, REPRO 853A, AOYUE Int853A/853A allows in easy and efective way repair LCD/Touch screen. Did you ever got in your repair center broken glass ? Do you rememeber how much whole LCD cost even if LCD/digitizer works well only glass was demaged. Now at 1/10 price of whole LCD you can replace to your client broken glass by heating up LCD. If You already have preheater and want a lower cost extend its capabilities, this is ideal solution for You! 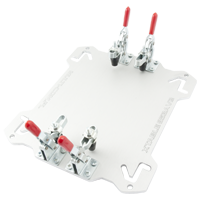 LCD Repair platform XTABLE PRO designed for mounting on the soldering station BGA NET Scotle, ACHI, Tachot and others allows in easy and effective way repair LCD/Touch screen. Did you ever got in your repair center broken glass ? Do you remember how much whole LCD cost even if LCD/digitizer works well only glass was damaged. Now at 1/10 price of whole LCD you can replace to your client broken glass by heating up LCD. If You already have preheater and want a lower cost extend its capabilities, this is ideal solution for You! 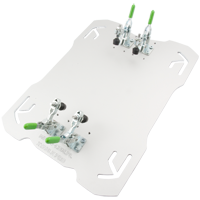 XTABLE PRO is compatible with all mount bracket xFrame available in our offer.